In a small bowl, stir together rosemary, basil, garlic, and pepper. Heat extra virgin coconut oil in a large skillet over medium heat. 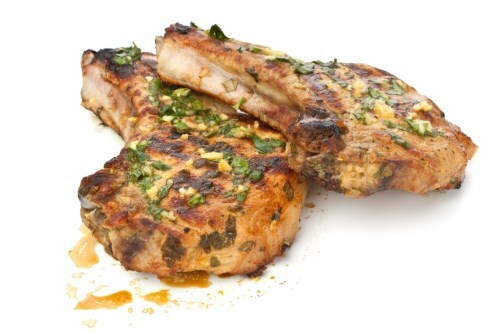 Dip pork chops in lemon juice, and sprinkle both sides with herb mixture. Place pork chops in skillet, and sear both sides, about 7 minutes per side. Reduce heat to low. Sprinkle feta on top of chops; cover skillet, and cook until cheese begins to melt, about 5 minutes.